The political temperature has been exponentially rising in Macedonia for some time now. 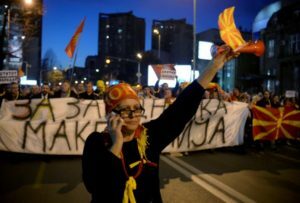 It reached boiling point on March 1st when President Ivanov refused to grant SDSM (Social Democratic Union of Macedonia) the mandate to form a government. Neither the governing right-wing populist VMRO-DPMNE, nor the opposition party SDSM managed to obtain the majority necessary to form Government at December’s elections. It was only recently after SDSM got the support from the MPs from three ethnic Albanian parties that it was able to request the mandate. The refusal to grant it surpasses the President’s power in Macedonia’s parliamentary democracy and is a flagrant breach of the Constitution–the President is obliged to give the mandate to whichever party or coalition that obtains the necessary number of MP signatures. This is not the first time that President Ivanov has acted as a pawn in the hands of VMRO-DPMNE, which has entrenched itself in power since 2006. His preemptive amnesty of criminal politicians in 2016 sparked a wave of anti-Government protests. However, a reaction of surprise to this highly predictable action can only be a product of bad analysis, or naive expectations that legal or constitutional rules can somehow become a potent constraint for criminal politicians fighting for survival. Reality has repeatedly proven otherwise. The fact that the President’s act clearly favors VMRO-DPMNE, and is unconstitutional and destabilizing for the country as a whole, does not make it any less rational for the party to use as a strategy for saving its own skin. Losing power would mean criminal accountability for a whole range of VMRO-DPMNE high officials and collaborators (as well as from the ranks of DUI–Democratic Union for Integration, the party formed from the ranks of Albanian guerilla fighters from the 2001 conflict, which has since 2008 been a coalition partner of VMRO-DPMNE). Ample evidence abounds–most of it exposed in the wiretapping scandal–some of which is already being investigated by the newly founded Special Prosecution Office, whose actions are likely to gain full momentum under a new Government without VMRO-DPMNE. VMRO-DPMNE’s conduct has been pushing and often crossing the boundaries of the legal, but has been perfectly logical. What is more difficult to decipher is the course of actions pursued by the SDSM, the Albanian parties and the “international community”, all of which are playing counterproductive roles, which serve to intensify instead of contribute to resolving the current mess. President Ivanov has invoked threats over the country’s sovereignty and independence as justifications for rejecting the mandate. In his public statement, he referred to the so-called “Albanian Platform” as the key reason for his decision. Most crucially he stated: “the platform is a post-electoral document constructed and signed in a foreign country in the cabinet of a foreign statesman, and with the mediation of a PM of a foreign country (Albanian PM Edi Rama).” He further added that “the platform threatens the sovereignty and independence of the country, bringing it in a position of subservience and dependence to another state. With this platform, the Republic of Macedonia is blackmailed, its unitary character, sovereignty and independence are jeopardized”. What is the “Albanian Platform” that he is referring to anyways? Both the timing and the unclear content of the “Albanian platform” have proven to be counterproductive. Besides serving as an excuse for the President not to grant the mandate, it has also served as an instrument for entangling further instead of unlocking the current political deadlock. Considering that no social, economic, political and ethnic grievances can be addressed in such a context of volatile political limbo as the one where the country now finds itself, it is difficult to understand what the social value of the platform is. Regrettably, it has also served to shift the heated political debate and the lines of division in Macedonia from the domain of accountability for criminal political and social injustice to the domain of ethnic identity politics and nationalism. Before the announcement of the “Albanian platform,” ethnic demands were largely absent from the public discourse. 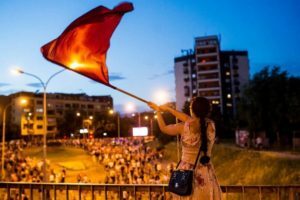 Over the past 2 years, the public, its ethnic Macedonian and ethnic Albanian sections, has been preoccupied and also mobilized in mass protests against the neoliberal plunder of the Macedonian state, institutions and commons, by the cross-ethnic VMRO-DPMNE and DUI criminal alliance. Succumbing to ethnic demands and concessions at this point in time only serves to distract from the real issues, which are about accountability for past transgressions, and the neoliberal backdrop where criminal politics thrives. Bringing ethnic demands back on the negotiating table has unsurprisingly been a golden opportunity for VMRO-DPMNE’s PR machine. The fuzziness and secrecy surrounding the “Albanian Platform” has provided it with all the necessary elements to heat up nationalist sentiment. Pro-VMRO protests have been ongoing across the country for a couple of days now. They have been most effective at preventing protests against the President’s decision, for fear of provoking violent clashes between the two groups. What is more, while most recent mobilization orchestrated by VMRO-DPMNE had seemed feeble and forced, nationalist sentiment unleashed by the platform seems to have injected the current mobilizations with a new energy. Although this doesn’t exclude the fact that the mobilizations are directly orchestrated by VMRO-DPMNE, as evidenced for instance in reports about high-school students being forced to attend protests en mass. 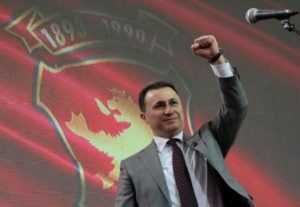 Meanwhile, in yet another stroke of PR genius, VMRO-DPMNE issued a public statement the day after the President’s decision, to say that they are happy to agree to a new SDSM Government, should they forego of the “Albanian Platform”, presenting an image of a victim, which is self-sacrificing for the benefit of the nation. In response to fears over the lack of clarity over the contents of the platform, SDSM and liberal civil society have pursued a relaxed, post-national approach and have responded with confirmation of its commitment to multiculturalism and affirmative actions, doing little to dispel fears and considering them as a residue of times long forgotten. This is either because of sloppy PR tactics, bad analytics resulting in a failure to predict and preempt VMRO-DPMNE’s response, or because they have indeed agreed to unpopular concessions in exchange for finally taking power back from VMRO-DPMNE. The newly-formed left party “Levica” has indirectly attacked “The Albanian Platform”, by proposing the need for a “Social Justice Platform” instead. This is a step in the right direction. In the current situation however, this has to be accompanied by a comprehensive anti-nationalist discourse, one which doesn’t stop at attacking Macedonian nationalism, but is also openly critical of Albanian nationalism as well. Anti-nationalist arguments are particularly potent when they come from “members” of the nation which is being criticised. In any case, the fact that Levica has been the only political actor in the current context, which has responded to nationalism with calls for social justice and anti-nationalist platforms, shows just how important and constructive its political role is in the Macedonian context. And more importantly how urgently the society needs to see Levica become a more powerful and more vocal player. Meanwhile, important regional players have only contributed to turning what is essentially a strategic attempt by VMRO-DPMNE to save itself into a question of a “discrimination against Albanians”. The President of Kosovo, Hashim Thaçi, has commented on his facebook profile, that “albanians should take the destiny of their rights in their own hands”. Similarly, Albanian PM, Edi Rama, in a post that attracted 30,000 likes wrote “without Albanians, there is no Macedonia”. This is far from helpful neighbourly interventionism as it contributes towards the restoration of ethnic identity politics instead of social justice and criminal accountability as the basis for a new social setup in the country. By extending a lifeline to the ruling regime, such statements leave the door wide open for the same rhetoric as the one that resulted in the armed conflict in 2001. Prisons in Macedonia: the Infected Wound ..
On the other hand, the responses by the international actors have so far focused predominantly on legalistic condemnation of the President’s unconstitutional decision. US Ambassador Bailey for instance has condemned the act as going “against the democratic principles and the rule of law”, calling on the President to reconsider his decision. Similarly, the EU Commissioner for Enlargement, Christopher Hahn, has tweeted that “in a democracy one must acknowledge parliamentary majorities, even if one doesn’t like them”. Federica Mogherini, the current High Representative of the European Union for Foreign Affairs and Security Policy, who was in Skopje on March 2nd, asked him to revoke the decision. Such responses are too little too late. They come by actors who have helped legitimize and rehabilitate VMRO-DPMNE by allowing it to negotiate its way out of the mass protests in 2015 and 2016 and cling onto power for 2 more years after the initial mass upheaval against their criminal rule had begun. What is more, these condemnations come at a time of power reshuffles within the ranks of the most important player in the region–the USA. It is difficult to predict what this might result in, but it may be symptomatic that Judicial Watch–a conservative anti-corruption think tank/investigative network, which has traditionally been very anti-Clinton,–has recently opened allegations against the current US Ambassador in Macedonia. The investigation alleges that Bailey “has worked behind the scenes with Soros’ Open Society Foundation to funnel large sums of American dollars for the cause constituting an interference of the U.S. Ambassador in domestic political affairs in violation of the Vienna Convention on Diplomatic Relations.” How the new administration defines its objectives and interests in the region may lead to changes in policy directions, which is what VMRO-DPMNE may be laying its hopes into. In any case, Macedonia now finds itself in a very dangerous limbo. It is more than certain that VMRO-DPMNE is prepared to risk even a civil war, if this is what it would take to secure its own survival and criminal immunity. On the other hand however, a negative role has also been played by the ethnicisation of the crisis unleashed by the “Albanian platform”. Social justice and criminal accountability has to form the basis for the new social setup in the country, in which political, social, economic issues will need to start to be solved by addressing all the aspects of neoliberal capitalist dispossession in the country, including, but not exclusively the ethnic one. Adela Gjorgjioska is a PhD candidate in Critical Social Psychology, at Sapienza University. She is a member of the Social Center Dunja in Skopje, as well as the leftist movement Solidarnost.